Jesus Christ taught his people to have respect for sacred things. He instructed His followers not to cast pearls before swine or to mock those things that were sacred to God. 13 And said unto them, It is written, My house shall be called the house of prayer; but ye have made it a den of thieves (Matthew 21). Mormons (a nickname for members of The Church of Jesus Christ of Latter-day Saints) are among the few religions that still have temples. Jesus was often found worshipping in the temple and it was an essential part of His religious practice. This story in Matthew tells us the temple was not just an ordinary church building, but was a sacred place meant to be treated with respect. Sometimes Mormons are criticized for not turning their temples into tourist attractions where outsiders can come in and watch or even mock the sacred events that occur. However, that would violate what the Savior taught about temples. The purpose of the temple is to provide a temporary escape from worldly cares and distractions, to take on sacred covenants to keep God’s commandments, and to learn the gospel. That would not only be difficult to do in the midst of a tourist attraction, but it would invite the wrong type of spirit into the setting. 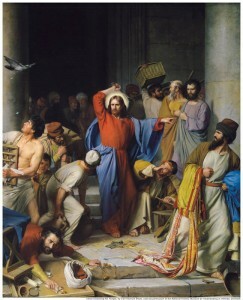 Jesus did not object to people doing worldly things, such as selling, outside the temples. He only objected to it happening inside, where sacred events were occurring. The temples were meant to be a house of God, as He said, and not a place for selling—or gawking. Today, much of the world has lost respect for sacred things. Sacred things are routinely mocked and those who are offended are told to “get over it.” Society loses something when it no longer respects the sacred—in anyone’s belief system. There are appropriate times and places for all things, including the selling of animals. What we learn from Jesus is that the temple is not an appropriate place for those things that do not further the work of God. Each of us has something in our lives that is sacred to us, something too important to be made fun of, treated lightly, or left open to public opinion. The Savior taught us to treat others as we wish to be treated. This means that when we find ourselves in the presence of (or even in a conversation about) sacred things, even if they aren’t our own sacred things, we need to ask ourselves, “If this were sacred to me, how would I want it treated?” When we are honest with ourselves in answering that question, we will find it easy to behave in an appropriate way. What Did Jesus Teach About Charity?